editor-in-chief from my first year of college just covered Virginia’s epic Final Four win for the Richmond Times-Dispatch. I hope you will help us continue our 150-year tradition of serving the Rutgers community by supporting referendum. Referendum 2019 is crucial for The Daily Targum’s existence, but it is also imperative for the students of Rutgers University—New Brunswick. 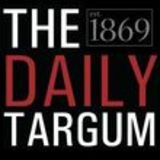 The Targum is the second-oldest collegiate newspaper in the nation, existing since 1869. For more than 150 years, we have created a daily paper, by students for students. The Targum covers Rutgers University, its students, athletes and professors, as well as college life, the surrounding communities and the ideas and viewpoints discovered. We proposed scarlet as the school color, we reported on the first collegiate football game in the world and we have continued to break news stories ever since. Rutgers community. This paper is as much yours as it is ours, and we hope you take part in supporting your school newspaper. its image. More importantly, we would not be able to exercise our right to journalistic integrity and free speech. WHAT HAPPENS IF THE TARGUM DOESN’T PASS REFERENDUM? WHAT DO WE USE FUNDING FOR? We print 10,000 copies of the paper Monday through Friday. It is a full-time job for editors, working five days a week from 4:00 p.m. until the paper is finished — usually between 1 and 2 a.m. We also utilize funds for equipment used by the editors, such as video and camera equipment, the software we license, the printing and delivery costs and the travel costs to cover our athletic teams. getinvolved.rutgers.edu and scroll down to The Daily Targum link. Click the yes button! Be sure to click next, and then submit. Students with 105 or fewer credits can vote, as graduating seniors will not be paying the term bill next year, and will not be impacted by Referendum. Students in the Ernest Mario School of Pharmacy can vote if they have 179 credits or fewer. Do not let Rutgers University— New Brunswick become the only Big Ten school without a newspaper. We have stood by you for 150 years, and we now ask you to stand by us. Sincerely, Rebecca Bright Editor-in-Chief/Co-CEO of the Targum Publishing Co. There will be an ask later, but first, a Rutgers story. Spring 1985. A brutal winter in the past. I had a semester of Rutgers locked down and settled in for the long road toward the degree promised land. I had a great academic and social life living on the edge of civilization in Voorhees Hall, Room 420, grinding out the 100-200 levels. Like so many other new students before and after me, I attained the point of: “Right. This is going to work.” Yet a hole remained in my Rutgers experience, with a daily reminder. Each morning — and yes, some afternoons — at Neilson Dining Hall: Raisin Bran, black coffee and The Daily Targum. When I first arrived at Rutgers in the fall, I had what turned out to be one of the most consequential surprises of my life. What? The paper is published every day? Is this for real? How is this done? I became a regular reader of this independent — i.e. 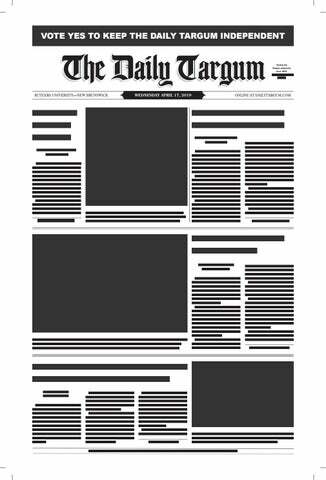 not part of the University — student-run newspaper that connects the vast institution that is Rutgers. Now, I wanted in. The Targum to me is many things, but first it was evidence that I now belonged to a consequential, substantial organization. Rutgers is immense, diverse and ever-changing. I was a single undergraduate among thousands who reside on campuses spread across miles. And the Targum bound us as one. North. Central. South. In-state, out-of-state. International. We are all “On the Banks.” The Targum is proof. It strives to provide vital, essential institutional cohesion. A common identity, a history and — for those who have made it all happen for the past 151 years — practical know-how and varied career opportunities. The Targum alumni occupy significant positions in the news business, some at The Wall Street Journal, The New York Times, Bloomberg and in many other fields. I joined the newspaper. Staff writer. Associate News Editor. Senior News Editor. Editor in Chief. Nearly four years of 40-50 hour weeks, and 12-credit semesters, to create what they call at The Wall Street Journal (where I was an editor) the “Daily Miracle:” Producing a newspaper every day. It is not easy. Nor cheap. Now the ask: It is immensely important for you to vote “YES” in the Targum referendum. A “YES” vote is a green light for a small term-bill fee once a semester — the cost of a round of lattes, or a burrito — to help fund the newspaper. It became much more than just producing a daily newspaper. It is the foundation of a long, successful career in Manhattan — Reuters News, The New York Stock Exchange, The Wall Street Journal, Bloomberg — built on what I learned at the Targum and with the support of friends I met there. Lifelong friends. And my wife of 26 years. It is more than just another student activity. teaching, writing, law, production, design and more — not just news. For more than 150 years, the Targum has chronicled our eminent institution. A great university requires a great independent newspaper, dedicated to the community it serves. Vote YES for the Targum referendum today. And JOIN the Targum! alike learn about campus news and University life. It provides a common thread to bind and inform the community. It is hard to imagine Rutgers without a daily newspaper. Student funding is key to the Targum’s sur vival. I urge you to vote yes for referendum.